A couple Saturdays ago, the 14th, I spent the day wandering around Greenwich and Canary Wharf with my friend Alice, taking photos. If you've been following my flickr account, you'll have seen those photos by now. 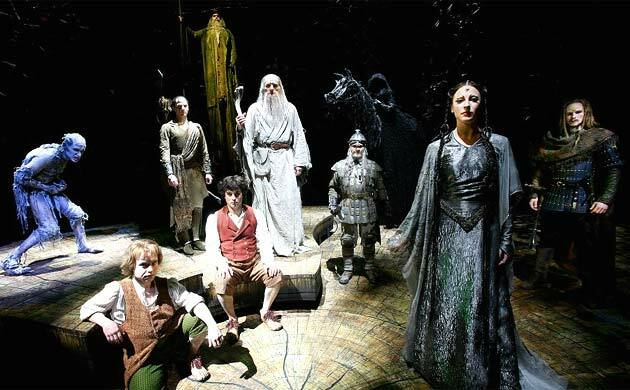 Later that evening, we went to the Royal Drury Lane Theatre to watch a show, the Lord of the Rings musical! We got front row tickets in the Grand Circle, the first level above the ground floor, so we had an awesome view. When we walked in, we saw that the backdrop of the stage was a giant golden ring, with tree branches thickly growing all around it, and coming around the sides of the theatre to cover most of the boxes. A bit before the show was scheduled to start, a bunch of Hobbits came out on stage, probably about 10-15 of them, some of them with nets on long poles. In the air high above the stage danced little lights, fireflies, that the Hobbits tried (and succeeded) at catching with their nets. After they had caught and bottled a bunch of these fireflies, they shook up the jar and let them free, whereupon they flew through the ring and danced around behind the backdrop, while the Hobbits broke out in dance on the stage. When the show actually began, it started with Bilbo's long awaited party, for his eleventyfirst birthday, at which he puts on the ring and disappeared! And he disappeared from on stage, just like that. It was pretty cool. The stage itself was very very cool. Set into the floor was a giant turntable, which was split into a whole bunch of pieces, each of which could raise and lower independently. They used this to make stairways, or valleys, or rough rocky areas that Sam and Frodo stumbled through and climbed up. It was incredibly well done. I don't remember what part of the show it was, but Aragorn came down out aisle and was shouting down to the people on stage. It was the only time he did that, and it was right next to us, as we were at the front row of the balcony, on the edge of the aisle. Gollum was great, doing lots of jumpy skittery sneaky Gollum moves. 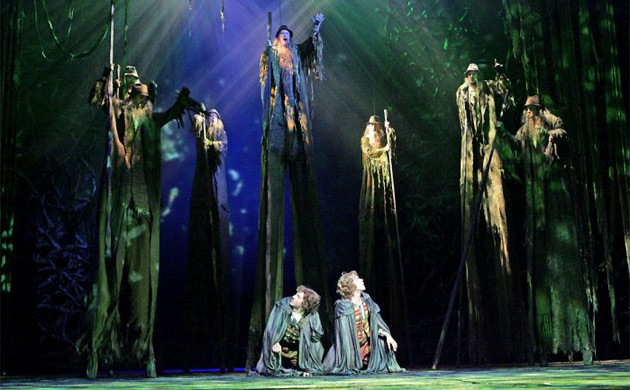 The Ents were also really cool, guys on stilts with all sorts of stuff on them so they looked like trees. When Gandalf fell on the Bridge of Khazad-Dum, the Balrog was really great. It was huge, and it grew up taller and taller from behind the "bridge" they had transformed the stage into, and as it roared at Gandalf, all sorts of bits of black paper was blown out from it, really adding to the effect. It was so totally worth it, I had a grand time. I've been wanting to hear that since I first heard about it years ago, when Sara was thinking about auditioning for the one in Toronto. I'm glad I finally got to go see it. On my way home from work yesterday, on the #70 bus after taking the central line, I was handed a survey form and a pen as I got on the bus. At the exit doors of the bus was another fellow collecting the forms from people as they got off. It had all sorts of questions about how frequently I use various modes of transport in London, though I do seem to recall it didn't have any questions about how long I have to wait for any of them, or any questions about the quality of the service. In other news, I've discovered that the route to work I originally thought was slower is actually faster. I had a streak of bad luck with buses not showing up on time earlier, which made this route slower, at the time. Now though, the #70 seems to be showing up more regularly, saving me anywhere from 10-15 minutes every morning. Yay! Train stations are pretty cool. They're kind of like airports, but without all the dealing with customs, security, international vs domestic terminals, etc, at least in the train stations I've been in so far. London Paddington has a smell to it, the scent of fuel and oil. Most of the stations I've been at, the trains are predomonantly electric. There, the opposite seems to hold true, and you can smell it. I love the smell. This train is pretty posh too. Every seat has a cloth ... thing... over the headrest, so you're resting your head there, instead of on the seat itself. I don't really see much of a point to it myself, but until now, I'de only seen it in the first class carriages. When I bought my ticket online, I didn't select "forward facing" as I should have, when I was given the choice. Even if you don't, the online tickets give you a seat reservation, which I didn't realise, and as it happens, not only did I get a forward facing seat, but I got a table as well! On the way home from work on the tube yesterday, I saw an ad in a paper here for 104.9 X-FM. Bring back any memories, Vancouverites? I'm over a week behind on my blogging now, having not talked at all about my night out in Bristol, or the family gathering the next day. Saturday last, I caught the train to Bristol, wisely deciding that driving is a bit beyond me for the time being. Stacey, my cousin, directed me which bus to catch from the train station, and which stop to get off at. Unfortunately, without being able to see the name on many of the stops, I got off at the wrong one (slightly similar name) and she and her friend Ben had to hop back in his car to come pick me up. We got to her place, dropped off my bags, and shortly headed into town to do some shopping. We were all starving, so before any shopping, we found a Weatherspoons, a chain of pubs favoured by students for their good cheap food. I don't remember what I had, possibly a meat pie, but it was certainly tasty. Once we were all fed, we got down to some shopping. The girls had all planned to dress up 70s/80s style to go out to the club, so Ben and I tried to find some sort of 80s looking clothes for the evening. Eventually, I decided to go with a sort of "Top Gun" motif, with aviator shades. After our shopping, Ben drove us back to Stacey's flat, and we relaxed there for a while, had some naps, and then started on the drinks. We were there quite a while, waiting for everyone to get ready, but we did eventually head to the club. The club was fun, I had mostly rum & coke, and danced until they closed, which was surprisingly early, 1 or 2am. After it closed, we wandered along the waterfront, trying to find something still open, that didn't have a ridiculously high cover charge. At one point, while we were standing around, Ben was demonstrating to Luke, Hannah's brother (Hannah is one of Stacey's flatmates) how do do a scrum in rugby. They set up, shoulder to shoulder, and scrumed for a moment, when suddenly 4 police appeared from nowhere and pulled them off of each other. It took a good 5 minutes of explaining to convince them that there was no fight going on, and that everything was friendly between Ben and Luke. We did eventually find somewhere to go for a bit, but it was pretty quiet, and the drinks quite expensive, so we only stayed a short while before going back to Stacey's flat. Back at Stacey's, a few of us sat around watching youtube videos of various comedy groups before finally hitting the hay. I felt like I could have gone on a bit longer, but I had a train to catch at 8:50am that morning, and Hannah and Luke had a flight to catch (and packing to do first, I gather) so it was probably good that we didn't party too late. Douglas Coupland's descriptions of Vancouver circa City of Glass are closest to my sense of the place. It's hemmed in and separated from the rest of the world by an ocean, a border, mountains. And then there's the unknown and incomprehensible north. Vancouver sits there, insulated to some extent, but picking up influences from across the ocean and across the border. The signals seem to be amplified by those symbolic barriers. Psychogeographically, I identify with greater Vancouver more than I do with the rest of Canada, which I have a fondness for and good feelings for. Vancouver's peculiar culture feels like home. It's an excerpt from an interview with William Gibson. I haven't finished reading anything past the paragraph after that yet, but that experience was just so shocking that I had to post this before I carried on. Update: Fixed the link to the interview. I really must thank Ben for his excellent shoe recommendation. These Ecco shoes have seen countless miles of London's pavement, yet are still as comfortable to wear as when I bought them. They're even fairlywater resistant, which is useful here, considering the huge numbers of puddles everywhere when it rains. They still look quite sharp too. They certainly weren't cheap, but they've paid off. Thanks Ben. I've been putting off blogging about my weekend for a bit because I'm rather embarrassed about something that happened. See, I decided that, on Sunday, I would drive to Bristol to visit one of my cousins. Yes, that's right, drive. I joined that car club I blogged about last week, and decided that Sunday would be my first time driving here in Britain. I was prepared to deal with the traffic. I was prepared to deal with the roundabouts. I was even confident I could deal with driving on the wrong side of the road, and shifting with the wrong hand. What I hadn't bargained on, however, is something else that comes with sitting on the other side of the car. It completely and utterly destroyed my sense of where the corners of the car were with respect to myself. That's why I hit the parked car. Yeah, you got it, I had my first "my fault" accident in 11 years of driving. I didn't "hit" it, so much as scrape along the side of it. Both cars were perfectly drivable, and nobody was injured (there was no-one in the parked car,) but there's cosmetic repairs to be done on both vehicles, and I have an insurance deductible to pay. Thankfully, when I joined this car club, I opted to pay a small monthly fee in order to have a lower insurance deductible. Boy has that ever paid off now. I'll be taking some driving lessons before I go driving again, I think. I need to find some way of relearning where the corners of the car are. Learning it the first time is one thing, but now, overcoming the 2nd nature that it's become is going to be even more difficult, I suspect. In other news, I had an absolutely fabulous time in Bristol with my cousin and her friends. It's a beautiful city, and I'm looking forward to more trips there to explore it properly. On Friday night, after work, a bunch of us from work went out to a mobile industry drinks night at a pub, where one co-worker was doing a presentation about our company. I had a few drinks there before going out to a club dancing with a couple of them. I danced all night long, and had a great time. At one point, I returned from the toilet to find the music quiet, and the dance floor still, and nearly empty. 4am had rolled around without me even noticing. It's like I'm 21 again or something. I crashed on their couch, and got home at around 2pm. This coming weekend promises to be quite busy and interesting again. On Saturday, I'm heading to Bristol again, though by train this time. My cousin is going to take me clothes shopping, and then out clubbing with her friends. I've been told Bristol has a good club scene, so I'm looking forward to that. On Sunday, there is a great big family gathering happening at the home of one of my dad's cousin's son's house (my 2nd cousin? Great cousin?) I'll be doing my best to arrive there without a hangover, but I suspect a little hair of the dog will be in order. I'll be seeing relatives there who I haven't seen for years, and others I've seen already since I got here, so I'm sure it will be a fun day.